Written by: Jaime Mejias Jr.
Halo fans everywhere rejoiced when Microsoft announced that the Halo: The Master Chief Collection was more than a rumor. I mean, to be honest, when I heard those words it took everything I had to not cry tears of joy. They’d drop from my eyes like multiple frag grenades, exploding simultaneously while launching me through the stratosphere of excitement over this awesome bundle. Halo: Combat Evolved Anniversary, Halo 3, Halo 4 and the shining star of the whole package, Halo 2: Anniversary all on one disc with some nice extras thrown in on top of that – yes please! I waited patiently for the day I could get my hands on pure nostalgia on a disc. Unfortunately, after getting my hands on the collection, I couldn’t help but be disappointed with the final product. By now I’m sure everyone knows the story of Spartan 117 aka, the Master Chief. But, in case you don’t here’s a short rundown of the overall narrative. The Covenant, a group made up of different alien races, is trying to rid the universe of humans. Saving humanity rests on the shoulders of the last genetically engineered super soldier (Chief) and the humans rallying with him. After multiple battles, the humans discover a parasitic organism called the Flood and a weaponized defense system that utilizes giant rings or Halos. 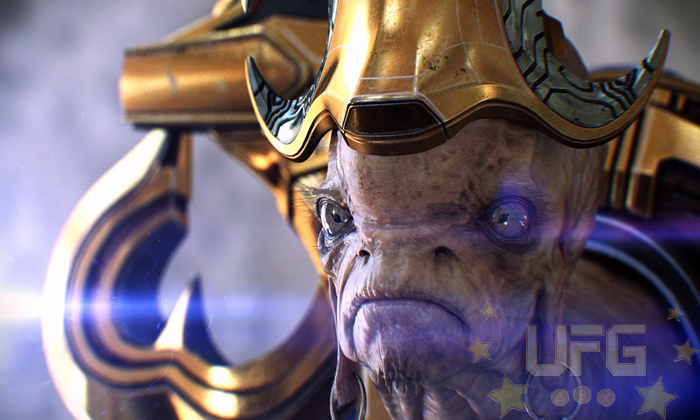 With the Flood claiming lives on both sides of the conflict, the only option seemed to be the Halo’s defense systems. Who built the rings and their true purpose is learned over the course of the Halo franchise; there’s more to the story of course, this is just to get you acquainted with the basic plot. Before I get to what disappointed me I’m going to highlight what made this collection great. The single player/co-op options are amazing. All four Halo campaigns are here in their entirety. Whether you are a longtime fan or new to the series, the collection delivers hours of story based fun. I do recommend everyone give Halo 2: Anniversary a go as it was clearly the star of the show. All of the cinematics are redone from the ground up in 1080p with new lighting effects, animations and more. Saber Interactive also altered some scenes and added new ones to help extend the story. They all look great and, to be frank, visually put some recently released games to shame. 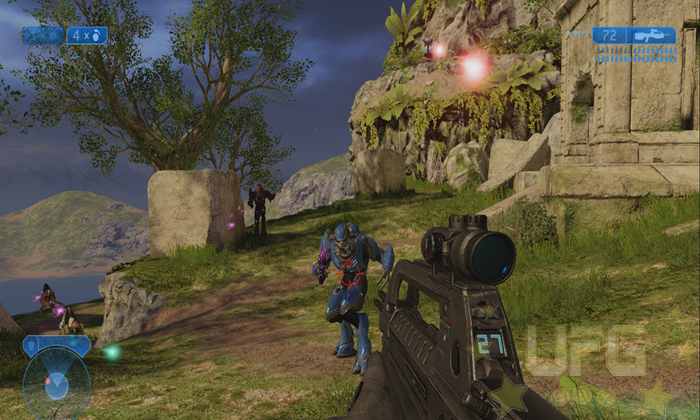 Although Halo 2 received the largest improvement overall, Halo: CE anniversary, Halo 3 and Halo 4 all saw upgrades to 1080p and a silky smooth 60 Frames per second. Besides the basic campaign options you also have the playlist mode which are a mix of levels that follow a theme such as boss fights, vehicles, shootouts and more. Some playlists span multiple titles and can be tackled cooperatively while others may stick to a single game or are meant to pose a challenge for solo players. They all come preset with their own difficulty and skulls (modifiers) and feature a scoring system/leaderboards though. Besides the scoring system and leaderboards there is also some customizable rewards for completing various playlist but, more on that later. Now to get to what was disappointing…the competitive multiplayer modes. Matchmaking seems to be completely broken; I can count on one hand the number of matches I could actually connect to. It’s normal for major releases to have some server issues when a game launches, especially when it’s as anticipated as Halo: MCC was. But after owning the game for almost a week and barely getting into the double digits in games played is just disappointing. Another issue I had was with how the playlists were put together. While you have some separate playlist like Halo 2: anniversary, Halo 2 Classic, Halo 3 etc. the game mode specific playlist such as Team Slayer or Big Team Battle are group together between games. For example, if I only wanted to play Halo 3’s Team Slayer mode, I wouldn’t be able to. The Halo 3 only playlist consist of Team Slayer as well as other objective based game modes while the Team Slayer playlist itself consist of Team Slayer across Halo 1, 2, and 3. I can see why this was done – when you minimize the amount of available options it can be easier to be connected with other players – but, I would prefer to be able to play what I wanted when I wanted to. Customization is something that’s seems to have been downgraded overall. 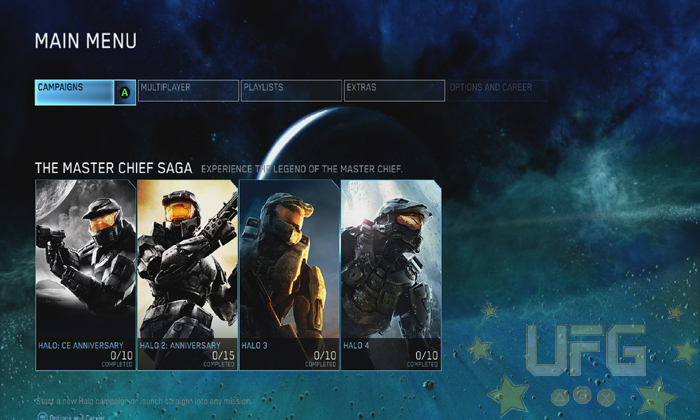 While you have options to change your Spartan’s gear in each game, the overall options are lacking in Halo 3 and 4. In the first few games, you could only change the color of your armor. When Halo 3 first came out though, you had the option of unlocking different pieces of armor to stand out amongst the other Spartans. There were even more options when Halo 4 came out. In Halo: MCC, you lose the option to mic and match pieces of armor. So, if you like a helmet but not the body piece in a given set, you are forced to wear it along with the helmet. This isn’t anything major of course. I just found it odd to all of a sudden place restrictions on something like customization. While the multiplayer aspect has its issues, there are some things that were done right. 343 Industries made a great call separating Halo: 2 Anniversary and Halo 2 Classic. Halo 2: Anniversary is definitely fun but the classic Halo 2 multiplayer has some of the most dedicated fans ever; when the original Xbox’s servers where going down a group of Halo 2 fans stayed on to keep the servers up for quite some time. Classic Halo 2 in the MCC is completely untouched with glitches and all intact. Fan favorites Forge and Theater mode make their return and can even be used in Halo 2: Anniversary. Theater mode functions just the same as always and matches across all games are stored together. And despite the connection issues, if you happen to have a lot of friends that all want to join in on some Halo fun, private matches still work just fine. With Halo: MCC they were trying to make the ultimate package for Halo fans. Four titles in one, all of the previously released multiplayer maps and upgraded graphics would be enough for anyone. Then they added access to the upcoming Halo 5 beta and Halo: Nightfall, the live action series. So if you’re a fan of the lore and can’t get enough of the campaigns, then even with the multiplayer issues you can still have a great time. But for the people that loved the competitive multiplayer and just wanted to relive the long gaming sessions from years ago, Halo: MCC isn’t up to the task. 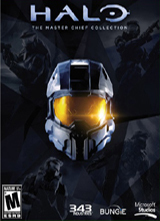 Halo is the shooter that revolutionized the genre and online multiplayer gaming on consoles in general. The multiplayer needed to work! Editor’s Note: An update went out on Thursday, November 20th to fix the matchmaking issues. Though this doesn’t change our score, it’s good to see the developers working hard to get things right! While the campaigns are great to play and private matches are fun, when one aspect of the game just doesn’t work I can’t score it higher. Once a patch is released and you can find games consistently than I see the score going up (at least in my mind). The visual upgrades across Halo: CE, 3 and 4 is already amazing enough. Add in the re-mastered Halo 2: Anniversary and your mind will be blown with how good it looks. Halo music is legendary with its mix of chants, orchestra and epic guitar mixes. If the multiplayer worked it would lead to endless replayability but the poor matchmaking is the one thing holding this game(s) back.